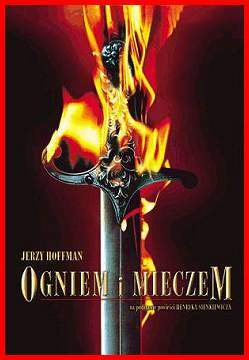 Scheda: Nazione: Polonia - Produzione: Agencja Produkcji Filmowej, Okocimskie Zaklady Piwowarskie, Telewizja Polska, Zodiak Jerzy Hoffman Film Production, Kredyt Bank PBI - Distribuzione: Divisa Home Video, WonderPhil Productions - Soggetto: dal romanzo omonimo di Henryk Sienkiewicz - Sceneggiatura: Jerzy Hoffman, Andrzej Krakowski - Fotografia: Grzegorz Kedzierski - Montaggio: Marcin Bastkowski, Cezary Grzesiuk - Scenografie: Albina Baranska, Joanna Dzwonnik - Costumi: Magdalena Biernawska-Teslawska, Pawel Grabarczyk - Musiche: Krzesimir Debski - Effetti speciali: Miroslaw Bartosik, Robert Chacinski, Ryszard Wojtynski - Formato: Color - Durata: 180'. 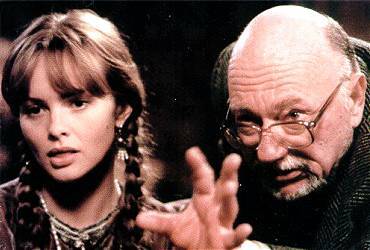 Cast: Izabella Scorupco, Michal Zebrowski, Aleksandr Domogarov, Krzysztof Kowalewski, Bogdan Stupka, Andrzej Seweryn, Zbigniew Zamachowski, Wiktor Zborowski, Wojciech Malajkat, Ewa Wisniewska, Ruslana Pisanko, Daniel Olbrychski, Marek Kondrat, Gustaw Holoubek, Andrzej Kopiczynski, Maciej Kozlowski, Adam Ferency, Gustaw Lutkiewicz, Dmitri Mirgorodsky. Plot Summary, Synopsis, Review: IMDb - pl.wikipedia.org - filmpolski.pl - en.wikipedia.org - entertainment.msn.com - greencine.com - zebrowski.stoplatka.pl - needcoffee.com: «...Jan Skrzetuski (Zebrowski) is fresh back home from the Crimea wars, when he runs unwittingly into the middle of a brewing civil war between the Polish nobility and the native Ukrainian Cossacks. 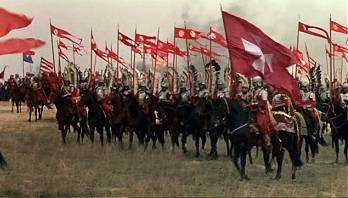 After having unknowingly released the most dangerous rebel leader Chmielnicki (Stupka), Jan encounters a few friends, and sets out to join the efforts against the Cossacks and Hussars. Along the way, he encounters one Helena Kurcewiczowna (Scorupco), and it’s love at first sight for both parties. Of course, it wouldn’t be a good movie without complications, and this one’s a doozy. You see, Helena has been promised to another. 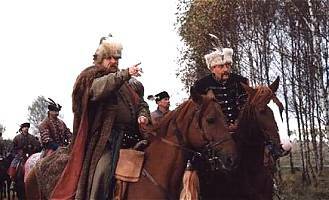 Namely, Bohun Szyszko, an officer and a Cossack who has promised to keep Helena’s family safe when the revolution comes. But his rebellious sympathies don’t sit well with Helena, and she is immediately smitten with the dashing Jan. The family would rather she be married to a Pole than a Cossack anyway, so they say very little when it becomes plain that Jan wants to marry her. 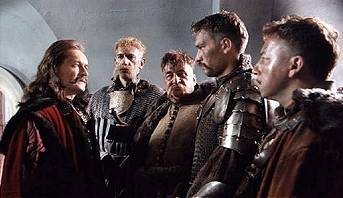 Bohun, perhaps understandably, is somewhat angered by this turn of events. As this love triangle heats up, the conflict with the Cossacks moves from rumblings and minor rebellion into open war, and Jan finds himself called to action alongside his friends. What follows is a whirlwind of warfare, betrayals, and a cross-country flight by Helena to avoid the savage and bloodthirsty Bohun. Jan endures ruthless battle, injury, capture, and prolonged separation from the object of his affection. Throughout all, however, he remains true to his ideals, his friends, and his beloved, which in turn elevates his baser comrades to higher stature through mere association. 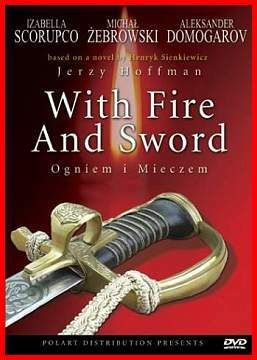 With Fire And Sword is a war epic on a grand scale. Broadcast originally in four parts, the total running time is right around three hours. The cinematography is sweeping, taking in massive battle sequences, but still deftly handled enough to keep all the scenes alive and interesting. Given the principle performances, that’s not so tall an order, but still. As to those performances...». Conosciuto anche con i titoli: With Fire and Sword; Con sangre y fuego.